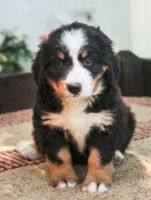 Bernese Mountain Dog breeders links and breed information on pups4sale.com.au. Bernese Mountain Dogs are a big breed, with both males and females growing to be 2 feet (60cm) tall or taller at the shoulder. They can weigh anywhere from 85 to 115 pounds (40 to 52 kgs), with females weighing a bit less than males. They have very large chests and long shaggy tails. It's easy to point out a member of this breed, as it will have a long black, white, and brown coat. The thick coat will keep it comfortable in the winter, but it can live in any climate. Behaviour: You won't find too many owners who don't love this breed because of their calm, loving nature. They will run around and play whenever someone wants to play with them, but they're just as happy sitting in the living room with their owners. They are pretty shy by nature, though, so early socialization is recommended. Bernese Mountain Dog (BMD) puppies are some of the cutest on the planet, but even at an early age they take learning seriously. It is recommended that owners get a pup at a young age so they can quickly get acclimated to their surroundings and so they can be trained early on in their lives. The breed is as gentle with children as any other breed on the planet. As long as no one hurts them, they will allow kids to jump on them and play with them until their hearts are content. This is why the breed is considered to be one of the best family dogs around today. The breed is great with other dogs, regardless of breed. They are very welcoming and trusting, so it's important that other dogs respect this breed or they will become shy or afraid of some dogs. They are actually know for working alongside other dogs, so it's in their nature to share space and even love other animals. The breed is known to be friendly, so they don't make the best guard dogs. Still, they have the same instinct as most other breeds to protect their owners, so there's always a chance that they will keep intruders from getting anywhere close to their people. They don't like to be left alone because they like companionship so much, but an hour or two here and there shouldn't be a problem. Still, it's best to always have a human around them so they don't develop separation anxiety. Training: Bernese Mountain Dogs do not respond well to harsher training tactics, so it is best to be very gentle with them throughout their training. While this breed is very smart, it can take them a while to learn the first few commands, but they catch on once they know that they will be rewarded for learning new things. Owners have to be patient with them though, or else all parties will get frustrated. Even though puppies take a while to learn commands when they're young, they learn to work very easily because it's in their blood. They love pulling hay and other farm items for their owners so much that it almost makes them as happy as they are when they are playing around at home. What's amazing about this breed is that they learn more advanced tricks easier than a lot of other breeds despite the fact that it takes them a bit longer to catch on to the easier tricks when they're younger. Many owners have seen them struggle during the easiest parts of obedience training and then sail through the more advanced classed. Exercise: Many people see BMDs as one of the lazier breeds, but that's only because they are so clam and relaxed when they do have a chance to lay down. The fact is that they need to exercise a lot to maintain a happy spirit. As mentioned above, they are hard working animals by nature, so they need to burn off that energy. If owners don't have farm work for their dog to do, it's recommended that they get longer walks than other breeds to keep them content. They don't even mind pulling kids around on a sled for an hour or so. Individuals are usually very good on walks. They don't pull their owners and will heel without having to be told twice. While they may be interested in other animals and people walking by them, they'll only interact if they know it's okay with their owners. Grooming: Bernese Mountain Dogs have long, thick coats, so they will shed a lot throughout the year. Owners should be prepared to brush them quite often to keep their fur from matting and becoming uncomfortable. It also keeps the house from becoming covered in fur. Individuals from the breed are also know for their ear issues, so regular cleanings are a must. It's a good idea to speak with a vet to figure out what the latest and best cleaning solutions are. Like many other larger breeds, this one is prone to bad breath, so owners should clean their teeth regularly. Doing so early on in their lives will get them used to it, so it becomes a pretty quick process. Their nails usually cut themselves because of all of the walking and running they do throughout the day, but they may need them trimmed every month or two. They are a calm and loving breed, so trimming their nails is a piece of cake. While this may seem like a lot of work, the payoff is a very happy and healthy dog. Healthy individuals generally live between 8 and 12 years, but there have been many cases where they live a bit longer than that. Arthritis is the most common health issue that they run into, mostly because they are a bigger breed and love to stay on their feet throughout their lives. Other common issues with this breed include bloat, cancer and cataracts, among others. For more information on the breed, a breed association such as the Bernese Mountain Dog Club of America is a good source also. Taking your dog to the vet regularly for checkups can greatly reduce the chances of these issues affecting them early on in their lives. They take pride in working hard no matter what, so physical issues won't always be obvious to owners. Who Should Own a Bernese Mountain Dog: They should have owners who have the time to train them when they're pups and then continue to give them workouts every day of their lives. Energetic, outdoorsy people will always be the best fit for the breed because they're never happier than when they are outside doing something. If you own a large house with a big backyard, then it may be suitable for a BMD. They need to stretch their legs very often, so giving them more space to do so will keep their bones in good health and will keep them from becoming anxious to get out of the house. Who Shouldn't Own a Bernese Mountain Dog: They are not apartment or small home dogs, so they aren't recommended for people who don't have bigger spaces for them to live in. They will gain weight quickly in smaller spaces and can become depressed if they can't move around comfortably. Some people are fooled by the fact that the breed is happy by nature, but that does not mean that everyone is going to be a great fit for this breed. They require a lot of time and attention, and can become destructive if they don't get the attention that they need. Conclusion: On the overall, Bernese Mountain Dogs are amazing animals that thrive as work dogs and with big families that can show them a lot of attention.